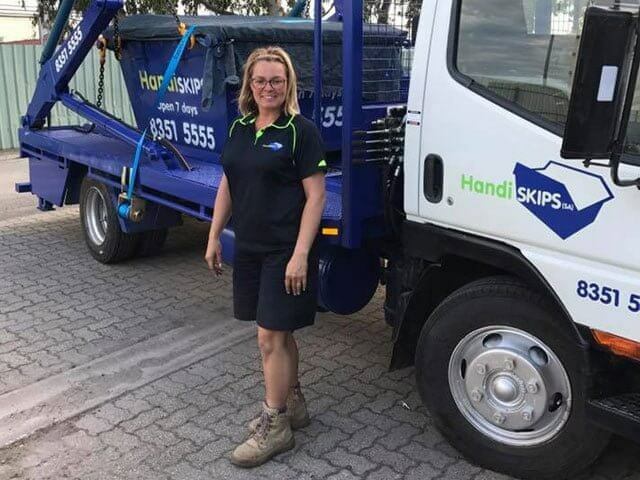 Handiskips SA is your locally owned and operated rubbish removal skip bin Adelaide service. When you need a reliable, efficient, environmental and budget-friendly waste removal assistance, look no further than Handiskips SA. We serve over 200 Adelaide suburbs, making us the most trusted and complete rubbish removal service. For all your household or commercial rubbish, Handiskips SA can take the worry out of rubbish removal issues. ARE YOU LOOKING FOR A LOCAL REMOVAL COMPANY TO HELP SOLVE YOUR WASTE REMOVAL PROBLEMS? Handiskips SA offers a quality five-star service. With us, 100% customer satisfaction is guaranteed! HandiSkips SA is more than just a Prospect skip bin hire service. We are experts in rubbish disposal and recycling, so let us help you to solve your rubbish removal and disposal problems. Handiskips SA aims to actively ensure all waste is recycled. We are trying our best to reduce the impact on the environment and currently have a recycling rate of 95%. When you call Lisa at Handiskips SA you get expert advice, friendly and timely service. Call our expert Lisa today to discuss your waste removal needs. We are happy to help you with everything you need to know about your Prospect rubbish removal including skip hire prices, skip sizes, permits, types of waste etc. Trust our professional team to provide you with the answers you are looking for.